MONTGOMERY, Edward L., 83, of Zephyrhills, Fla., passed away Thursday, November 2, 2006, at Florida Hospital Zephyrhills. He was born November 13, 1922 in Warren, Ohio to Clifford and Cloy Viola (Stephens) Montgomery. He was a veteran of the U.S. Army serving as a command sergeant major in Special Forces. Mr. Montgomery was also a member of the Masonic Lodge, the Scottish Rite Temple and he was a Methodist. He is survived by a daughter, Ruth Shaffer of Ramona, Calif.; three sons, Patrick L. Montgomery of Rockingham, N.C., Thomas P. Montgomery of Rock Creek, Ohio and Leslie D. Kaltenbaugh of Zephyrhills; many grandchildren and great- grandchildren; several sisters and brothers and friend, Barbara L. Smith of Sun City Center, Fla.
Graveside services will be 2:30 p.m. Monday, November 6, 2006, at Florida National Cemetery in Bushnell. Military honors will be provided by the Florida National Guard. Visiting hours will be from 6-8 p.m. Sunday, November 5, 2005, and 10 - 11 a.m. Monday, November 6, 2006, at Whitfield Funeral Home. 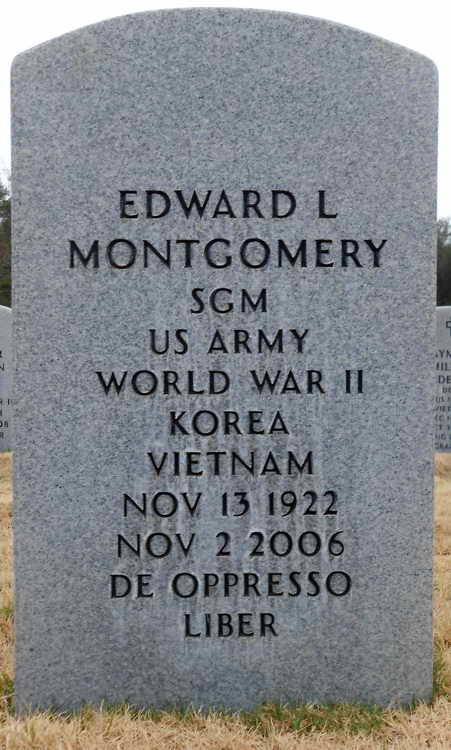 Grave marker for Edward L. Montgomery in Section 324, Site 1484 of the Florida National Cemetery, Bushnell (Sumter county), Florida. Edward enlisted in the Army at enlisted at Ft Hayes, Columbus, OH on 31 October 1942. Pvt Mongtomery completed jump school on 5 March 1943 and was assigned to the Medical Detachment. He was awarded the Bronze Service Star device for the Normandy, France Campaign, 6 June 1944.